The first-ever Ford Ranger Raptor is the ultimate expression of the Ford Ranger, and will be available for Australian off-road enthusiasts as a bold entrant in an all-new niche. It will go on sale in 2018 with a Manufacturer’s List Price of $74,990*. “We’re unbelievably excited and delighted to be able to confirm that the Ranger Raptor is coming to Australia in 2018,” said Graeme Whickman, President and CEO of Ford Australia. “The response to our announcement in September, and the interest from the global reveal back in February to bring it to market at such a sharp price only adds to the anticipation ahead of its arrival in local showrooms,” said Whickman. The Ranger Raptor will lead the Ranger line-up and be offered in other markets around the world, just as Ranger is offered in more than 180 countries. Ranger Raptor will showcase Australian design and engineering expertise in conjunction with Ford Performance Raptor DNA that builds on Ford’s strong truck heritage. 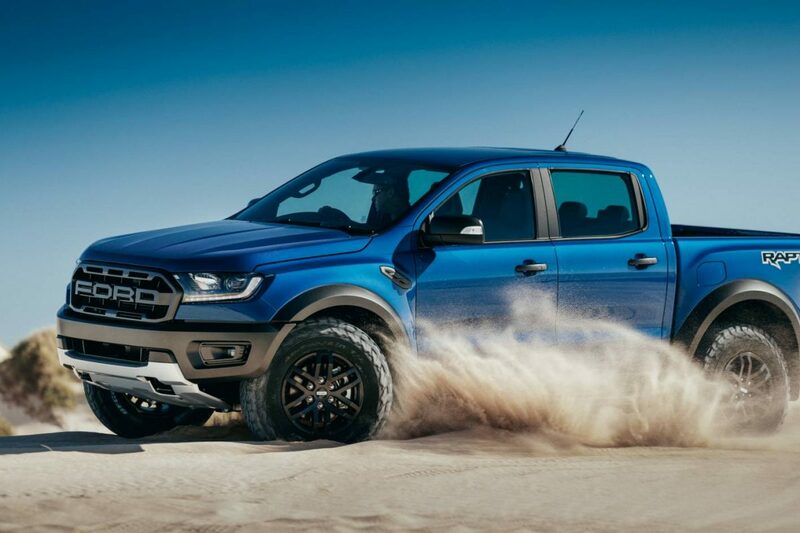 The Ford Ranger Raptor is Ford’s first performance pick-up truck for Australia. It comes with exclusive features unique to the pick-up segment, and has been developed to deliver the ultimate performance experience for off-road users, benefitting from locally-led design and engineering at venues across the world including Ford Australia’s You Yangs Proving Ground and Borrego in the USA, where the F-150 Raptor was tested. The current Ford Ranger is the market leader in 4×4 pick-ups as the best-selling 4×4 pick-up here in 2017. The Ranger Raptor builds on the inherent qualities of the Ford F-Series Raptor, and brings with it the Tough Done Smarter elements that meet Australian buyer’s light commercial needs. Ranger customers are increasingly using their vehicle for both work and recreational purposes, including off-road drives, and Ranger Raptor raises the bar. Leveraging Ford’s engineering experience in building tough trucks and global engineering expertise in performance vehicles, the Ranger Raptor is an extremely capable off-roader built on customer feedback from Ford’s performance and truck products, both in Australia and around the globe. Based on the Ranger with its Australian-led engineering and design, the Ranger Raptor has been developed for customers who desire a pick-up truck that delivers an unmistakably unique statement. The Ranger Raptor is made for off-road enthusiasts who appreciate an outdoor lifestyle and seek out the most extreme terrain, demanding an authentic, truly capable vehicle that’s a cut above other off-roaders. Ranger Raptor is the result of this vision. The Ford Performance Ranger Raptor will be offered as a single specification, featuring an all-new powertrain, advanced suspension and unmatched capability as the first Ford Performance pick-up offered in Australia. Ford Performance Raptor DNA begins with the Ranger Raptor’s aggressive stance, headlined by its ‘Ford’ block-letter from grille, HID headlamps with LED Daytime Running Lamps, and unique front and rear bumpers to build Ranger Raptor’s visual punch. Bolstered by its 33-inch diameter BF Goodrich all-terrain tyres, and flanked by Ranger Raptor-specific heavy-duty side-steps, the Ranger Raptor shows off-road ability from before its turned a wheel. Underneath the skin, Ranger Raptor’s race-bred long travel suspension with Fox Shox, aluminium upper and lower control arms, heavy duty skid-plates and underbody protection, which – combined with a unique chassis – enables Ranger Raptor to be the most capable off-road Ford Ranger. This includes wider front and rear tracks, greater ride height, increased approach and departure angles, as well as water wading capability that’s enhanced to 850mm^. 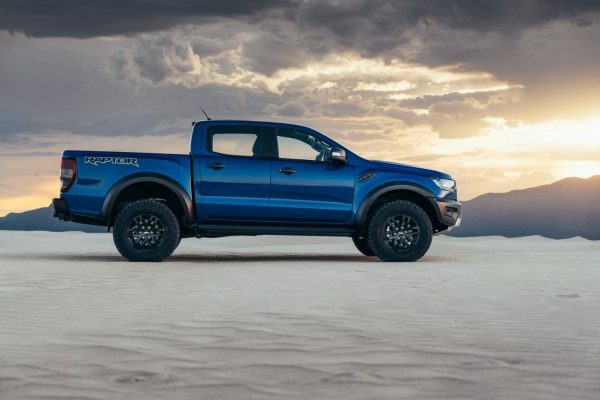 The Ranger Raptor will be powered by a new-generation Bi-Turbo diesel producing 157kW/500Nm through a 10-speed automatic with magnesium paddle shifters for high performance capability. 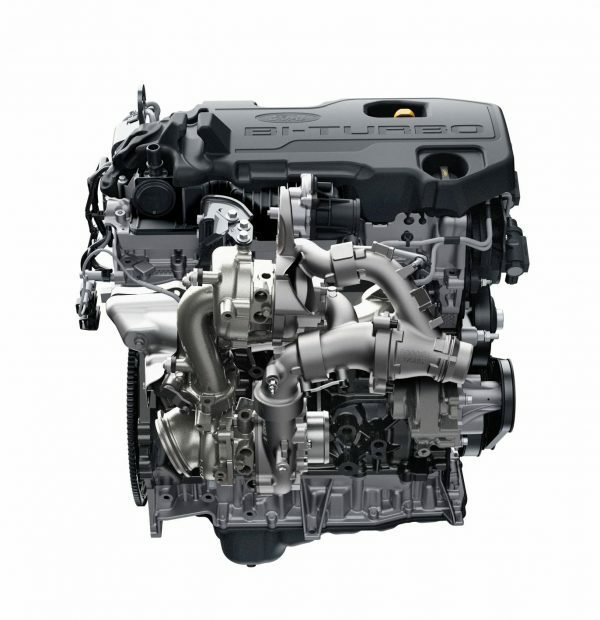 The flexibility of the powertrain is further unlocked through the Ranger Raptor’s unique six-mode Terrain Management System (TMS), which includes low- and high-range four-wheel drive and a locking rear-differential. The Ranger Raptor’s TMS introduces Baja mode, which is exclusive to Raptor DNA, and offers the ultimate off-road performance settings. 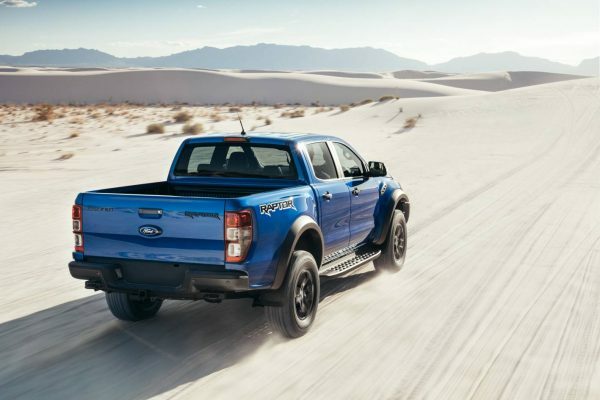 In addition, Ranger Raptor will introduce a host of convenience features as standard, including smart keyless entry, push-button start as well as a power tailgate lock. SYNC 3 with an 8.0-inch colour touchscreen and standard sat-nav, Apple CarPlay and Android Autoi compatibility is also standard for Ranger Raptor. 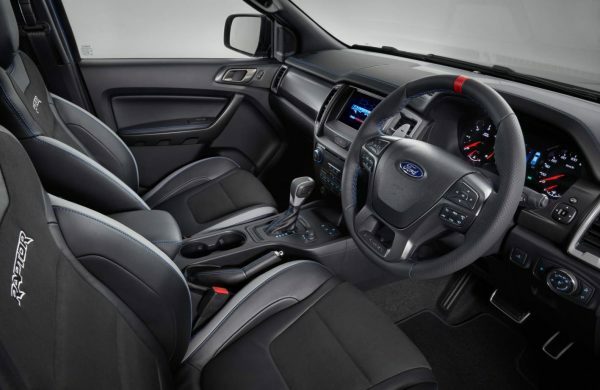 The Raptor interior also features exclusive leather-accented bucket seats, a unique instrument cluster with its own start-up display behind a Raptor-embossed steering wheel with competition-spec ‘straight ahead’ marking. Ford celebrated 100 years of trucks in 2017, and that expertise has been leveraged for Ranger Raptor. Earning its keep alongside the F-150 Raptor in other markets, the Ranger Raptor meets the stringent demands of Ford’s global truck line while delivering the driver – and passengers – that genuine Raptor DNA. The first-ever Ford Performance Ranger Raptor will be on sale in Australia in 2018.